In response to the extraordinary and consistent growth the gaming industry has seen in Macau in particular, and Asia in general, TCSJOHNHUXLEY are refocusing their strategic developments in the region. “Asia is an extremely important market to TCSJOHNHUXLEY”, company CEO Cath Burns tells Casino International – and she should know; having served as Vice President Asia Pacific for Bally Technologies for almost six years before joining TCSJOHNHUXLEY March this year, she’s no stranger to Macau or Asia. The priorities of TCSJOHNHUXLEY’s strategic growth plan call for the strengthening and expanding of the team and improving operational efficiencies across the region. Now heading TCSJOHNHUXLEY operations in the region is Rebecca Kingswell, recently promoted to General Manager Asia. “Rebecca’s knowledge and experience is critical to our growth plans for the region,” says Cath Burns. And in a region where talent is so hard to recruit and maintain, she is “delighted to have such an experienced leader to head up operations in Asia”. In her previous role as Executive Director of Operations, Kingswell was instrumental in the success of the company in the region. She has worked extensively in Asia over the last 17 years, gaining immeasurable experience and local knowledge. Rebecca has spearheaded the company’s success across the region, penetrating markets in Macau, Singapore, Malaysia, Vietnam, Cambodia, Myanmar and Laos. “Macau still remains an extremely important market for TCSJOHNHUXLEY,” Kingswell guarantees. 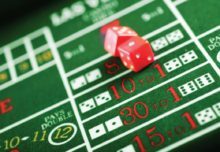 The company’s strategy for Asia’s gaming Mecca is to “continually develop products that will assist casinos in maximizing table game performance”. They do this by spending time talking to customers and acting on their feedback. “We have an exciting range of technical products, which allows casinos to tap into a younger market demographic and attract a new type of player to the floor,” Rebecca says. Operational efficiencies in Macau have also been implemented to maximise growth potential and streamline services. These include expanding warehouse facilities to provide better consolidation of orders and enhance the ability to hold more stock, thus enabling quicker turnaround of orders. Besides Macau, Rebecca believes there is a lot of growth potential in other Asian markets particularly the Philippines, Vietnam and India. The focus now is on “developing plans that will allow us to deliver the best products, service and support in the region. And as markets expand, we will continue to expand our team with them,” Rebecca adds. TCSJOHNHUXLEY is already strategically placed in Macau and Singapore, with additional technicians located in the Philippines and Malaysia, to ensure after sales service and support to cover Asia. Technical Service and Support is also being restructured and the company plans to continue to recruit the best technical candidates available that will allow greater customer coverage of Asia and the growing Macau base. An operation is only as strong as its team, and TCSJOHNHUXLEY has been on the prowl for talent. “The importance of building a strong focused team and maximizing operational efficiencies in this rapidly expanding market is critical to our success,” believes Rebecca Kingswell. Of note is the new appointment of Sales Director for Asia, Andrew Hanley who joined the team in early June. With 18 years of gaming industry experience, Hanley has worked extensively in the Asia Pacific region and has been based in Macau for the past five years. As Vice President International Sales at Transact Technologies, and more recently Sales Manager Asia Pacific for Bally Technologies, he has extensive sales, marketing, operations and customer service experience as well as considerable local market knowledge, which will be invaluable as the company develops its sales strategy in new and emerging markets, as well as continuing to support established customers. Another Sales Executive, Max Young joined the company at the beginning of May and comes to TCSJOHNHUXLEY with a strong sales and marketing background, having lived and worked in the US for 15 years, relocating to Macau in 2006. For the last five years he was Director of Sales for a large restaurant and event management company, where he increased sales by 50 per cent in just six months. The group is banking on his knowledge and strong customer focused experience to provide an added advantage to grow sales in the region. Held earlier this year in May, the premier gaming event for the region, G2E Asia was the ideal stage for TCSJOHNHUXLEY to debut new products and developments in the group’s award winning systems. Following a multi-year global distribution agreement with Gaming Commerce Pty Ltd., TCSJOHNHUXLEY debuted BaccPo at G2E Asia; a new fast-paced table game that combines the thrill of blackjack, a simple hand ranking system similar to baccarat, and the adversarial elements of poker. Demonstrations ran regularly throughout the two-day expo to showcase BaccPo to industry professionals and land-based casino operators. The TCSJOHNHUXLEY stand registered significant traffic from interested industry professionals eager to find out more. Unlike traditional baccarat, BaccPo is not governed by a tableau of fixed rules, and instead brings a level of skill into play. It can be offered as a casino – house – game, as well as a peer-to-peer table game. Hand play is also much quicker than in blackjack, which means more excitement and enjoyment for the player, and ultimately more repeat customers for the casino. Greatly enhanced game pace, coupled with a small but positive increased house advantage for the casino version, means BaccPo has definite potential to outperform traditional baccarat in terms of hourly revenue for the casino operator. Initially launched at Crown Casino in Melbourne, Australia at the beginning of the year, BaccPo has been equally popular among players seeking an alternative thrill to traditional table games currently offered in casinos worldwide. Penetration and diffusion of the game in the Asian market is just the next step. The peer-to-peer version incorporates the adversarial play of poker with hand rankings similar to baccarat. This adaptation of BaccPo offers casino operators enormous promotional opportunities, with the potential to generate unprecedented brand awareness through large televised tournaments, to be broadcast to key audiences, and used to attract a greater share of the high roller and VIP markets. Also showcased at G2E Asia were the latest developments for TCSJOHNHUXLEY’s SuperNova Table Bonus System. This floor-wide progressive and game bonusing system creates added value to all live table games including roulette. The system drives increased revenues by heightening player excitement and loyalty to all of the property’s live table games. This makes it the world’s first progressive system for local and networked table game applications that can be used on any live table. One of the most interesting features of SuperNova is that it can now be applied to any table game. Its multi-level, event-based and mystery prizes can be employed even on games that don’t normally run progressive jackpots. “You can add the SuperNova system to any game, even one without a progressive jackpot, and just have it running in mystery mode. Having listened to the needs of casino operators, our latest SuperNova developments link your card and roulette tables together,” explains Harley Jackson, Technical Director TCSJOHNHUXLEY Australasia, who headed up development of the system. SuperNova incorporates the wide screen Omni Progressive Display featuring multiple odometers and can be re-skinned and themed to integrate with the base table game and reinforce the overall brand of a particular casino operator. An intuitive touch screen handset allows easy dealer operation and quick game change configuration. 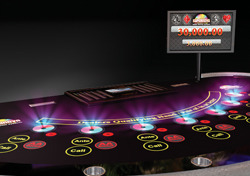 The unique SuperNova animated bet sensor is capable of an almost infinite range of attractive mode effects and enticing sequences such as pulsating, spinning, and sparkling to drive side bet participation and increase the energy level of the game. Bets are made and recorded when chips are placed onto the Supernova sensors fitted to the table. Players can play the base game alone, or they can choose to play the base game plus a mystery bonus, and in many cases a progressive jackpot too if supported by the base game. An optional illuminated Bash Button adds tactile participation to a range of games including double up features and secondary bonus games. TCSJOHNHUXLEY also delivered significant updates to its award winning Gaming Floor Live system at G2E Asia with the integration of Sic Bo to the platform. Gaming Floor Live is a real-time game optimisation system designed to maximise key performance areas and profitability. TCSJOHNHUXLEY argues that, unlike any other product on the market, the system automatically captures live table game data, which in turn provides vital information to maximise turnover, maintain house advantage, reduce operating costs and understand opportunity costs. Gaming Floor Live, originally developed for roulette games, now also provides security and performance data for baccarat games and, with the latest addition, also integrates with TCSJOHNHUXLEY Sic Bo tables. “With its easy to use dash board approach, risk can be managed and performance analysed in real time,” Simon Witty reasons. The system can benchmark optimum results and compare real-time performance against the selected benchmarks, providing live feedback to dealers, and floor and casino management. With the power to monitor pits remotely with local area network or wide area network connectivity, casino management can now measure key performance areas across their live tables. Gaming Floor Live uses industry standard software and database architecture allowing it to easily operate within existing IT infrastructure. All data is encrypted and the system has comprehensive user and management control functions. Data, reports and real time alerts are available via a dashboard application, giving casino staff a snapshot of their operations as well as the ability to drill down to detailed analysis. An easy to use desktop application and SMS alerts notify gaming staff of any exceptional activity. Using the TCSJOHNHUXLEY Elite Sic Bo display offers seamless connectivity with Gaming Floor Live. Functions include open/close table and change table min and max directly from the system.